A few months ago I saw an ad in the local paper about an 11 year-old boy who had suddenly been diagnosed with an inoperable brain tumor. He was having chemo and radiation and his family was asking for donations to help out. I ripped out the info and begged my husband to write a check (he did!). But I wanted to do more. The story struck a chord with me on so many levels. Not only do I have a son of the same age, who also loves Star Wars and Legos, but I had a similar tumor-experience when I was that same age. I was one of only 3 cases, at the time, and all treatments were experimental. I was told I probably wouldn't live past 25 and I wouldn't have children. I turned 39 on Monday (Happy Birthday to me!) and I have two awesome kids! So, I've always wanted to be able to share my good fortune - or maybe pay it back... or pay it forward?- whatever- I wanted to do something! 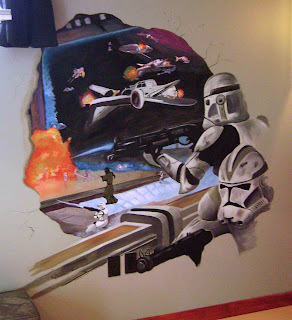 Then, out of the blue an artist friend asked if I'd help her do a Star Wars mural for a sick kid and I said "yes!" (even though I am supposed to say "no" to everything right now). Guess what? 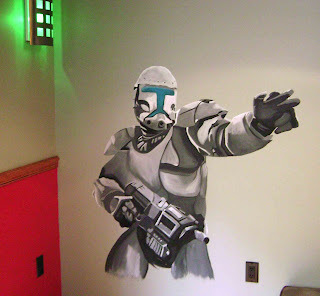 It turned out to be a mural for this same 11 year old! Make-a-Wish granted his dream of having a movie theatre in his basement - complete with a huge tv screen on the wall, luxurious reclining seats with cupholders, an intimidating stack of electronics, Darth Vader popcorn cart, foosball, lots of legos, and our mural. It was amazing. (sigh) So... here are some pics of our lovely mural. The idea was that the stormtroopers have blasted a hole in his wall and are fighting a big battle in the docking bay. 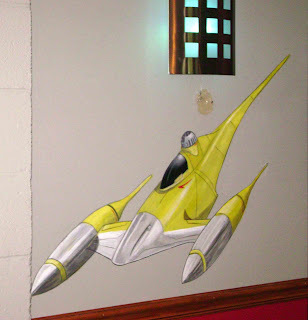 The Naboo fighter is on a different wall. I picked it because it was yellow ("ooo... pretty!") and we got tired of painting gray stormtoopers. Yes, I know, they aren't actually storm troopers, my son corrected me on everything, but that's what I call them. :-) If anyone else wants Jen and me to paint a mural for them, we are even better at fairies and such - or at least the fuzzier Star Wars characters! !